You are here: Home / Norwex Products / Kitchen / Did You Know That Norwex Sells Green Dish Soap? So, you can buy dish soap everywhere and anywhere. For super cheap, too. So the question is: why does Norwex make dish soap? And, why would you want to invest in it, since other dish soaps are, quite frankly, cheaper! Biodegradable, and free from phthalates, SLS, SLES and dyes. It smells Gooooooood. It has a crisp, citrus aroma. And because the fragrance is natural, it’s not the gross orange-cleaner smell! Put on your science-geek glasses for this read, you’re gonna be super smart about ingredients after this one! While writing this article, I did deeper digging than I had ever done regarding the ingredients in this product, and was SUPER impressed! So, I know that you don’t know how to pronounce some of the words in the ingredient list. Let me give you a few cool facts about these ingredients. Chloro-2-methyl-4isothiazolin-3-one, Methyl-4-isothiazolin-3-one – that big, long confusing one is a formaldehyde-free preservative that is rapidly biodegradable and non-persistent in the environment! Your dish soap is going down the drain with the dirty dish water, and is therefore introduced into the waterways and groundwater. It eventually makes it into the ocean. The phosphates in other dish soaps are harmful because they feed algae and bacteria in the oceans, causing them to grow uncontrollably and consuming much of the oxygen in the water. This in turn can cause fish and other ocean life to suffocate. Oh my. If you want to have a positive impact on the environment, the ingredients in the Norwex Dishwashing Liquid demonstrate how GOOD this dish soap is for the environment! The ingredient list ALSO demonstrates that it is hypoallergenic with a neutral PH, so this product is good for your skin! If you don’t use dish gloves (all of my friends HATE them), this isn’t going to be hard on your hands! But The Bottle Is So Small! When you look at this bottle, it seems small, but YES, the Norwex Dishwashing liquid IS concentrated, (like a lot of our products) so a little goes a long way! If you’ve never used a green dish soap, know that this dish soap does not behave like the ‘other’ dish soaps you’re used to. Since it contains less harmful ingredients than ‘standard’ dish soaps, the ingredient that makes lots of bubbles has been eliminated. Instead, the Lauyl Glucoside and Sodium Laurel Sulfoacetate, and Cocoamidopropyl all work together to create bubbles (and therefore, detergency). They just don’t create as many bubbles as you’re used to. Fellow Norwex consultant Crystal Moore has put this soap to the test. When she first used it, she did NOT LIKE IT AT ALL. She didn’t even use up the whole bottle, she disliked it so much! But then, Norwex reformulated their dishwashing liquid. Crystal gave the new formula a try. While it WAS better, she still wasn’t too sure about it, mainly because it was different than what she was used to (mainly, less bubbles). Her issue with it was that she didn’t feel like her dishes could be getting clean, with so few bubbles. 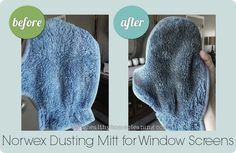 However, she learned from other consultants that she could use this soap with her other Norwex microfiber that contained BacLock, and that was a game changer for her to keep trying it. If you use Norwex microfiber that contains BacLock with ‘other’ soaps, they contain a lot of ’stuff’ that leaves residue in your cloths. From experience, other consultants and customers have found that the soap residue coats the silver, preventing it from working as well. The end result: stinky cloths! To avoid this conundrum (I just love that word! 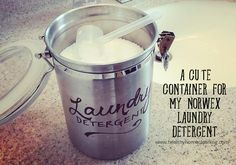 ), if you use a ‘cleaner, greener’ detergent, especially one without heavy synthetic fragrance, you won’t get that leftover residue, and you won’t have such smelly Norwex cloths. So, if you want to feel like an uber-environmentalist with soft hands, this hidden gem in the Norwex catalog is for you, too! Stay tuned for more, “Did You Know Norwex Sells…!” You can sign up to blog email notifications on the sidebar so you don’t miss out on any of them!